The antitumor pharmacological property of flavonoids is correlated with inhibition towards glyoxalase I (GLOI), a critical zinc-enzyme in the methylglyoxal detoxification pathway. In this study, 16 flavonoids were examined, and only baicalein (Ki of 0.183 µM) is identified as a potent in vitro GLOI inhibitor. X-ray crystallographic analysis reveals that baicalein chelates with the catalytic Zn2+ via its characteristic C6/C7 hydroxyl groups. 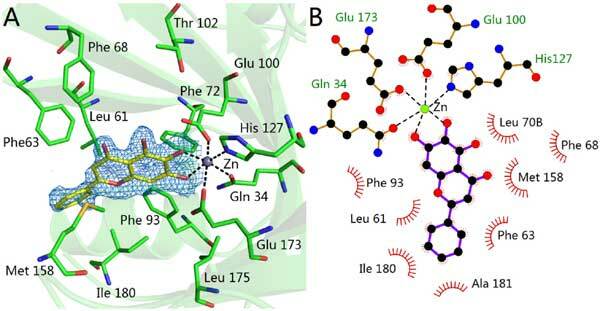 The coordination ability of flavonoids, and therefore their ability to inhibit GLOI, is determined by the Zn2+ coordination geometry, the rigid skeleton of flavonoids and the geometry of the hydrophobic cavity of the GLOI active site. This structural basis could be useful in predicting GLOI inhibition of other natural polyphenols. Baicalein, Crystal structure, Flavonoids, Glyoxalase I, Inhibition. School of Pharmaceutical Sciences & Centre for Cellular and Structural Biology of Sun Yat-sen University, Guangzhou 510006, P.R. China.